This week we have been holding a review of our school. This involves visiting lessons, looking at pupils’ work and talking with teachers and pupils. This is an important part of our self-evaluation and allows us to decide where and how improvements can be made. The review continues next week. We are also lucky to have people from outside the school who are joining us to assist in the process; this is very important, and is part of the collaborative approach that regular readers of this blog know we greatly value. Sports news! Congratulations to our Y8 and Y9 netball teams who both won games against The John Frost School this week. Also to Cai in Y8 who is now a first dan judo black belt, and to Chloe who was runner up in the Wales and West Cechetti (ballet) awards. On Thursday a Welsh artist, Rhiannon Roberts, came into school to host an art workshop which a number of our pupils were able to enjoy. They produced an excellent piece of work based on our school and our community. Everyone really enjoyed it, and we now have to decide where the finished article is going to go! Here’s a picture of the work in progress; the finished piece looks absolutely amazing! 7KH have knocked 7ED off the top spot for attendance! Well done! 10 CT came a very close second this week. Attendance overall is still up on last year, and the progress we’ve made in this area is a credit to everyone. No blog next week as it is half term.This marks the mid point of the academic year, but not for Y11 who are nearer the end than maybe some of them realise! Lots of support has been put in place for them, and this will continue over the half term break. There is plenty of revision to do over the week, and in some cases coursework to catch up on. 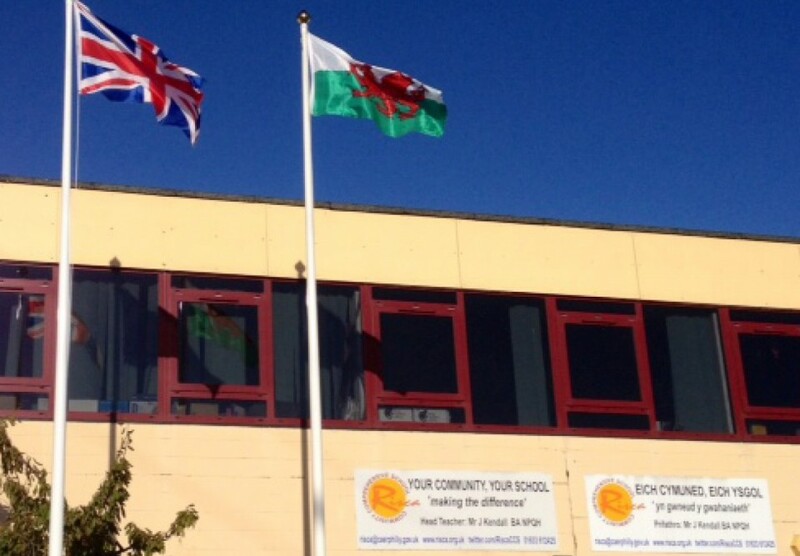 On Tuesday we welcomed two Welsh Government ministers to school to visit the ASD Centre. Both Kirsty Williams (Education) and Vaughan Gething (Health) joined us as part of the consultation on the new ALN code. We were also joined by our local AM and councillors and officials from Caerphilly Borough Council. The guests were welcomed by the Head Girl, Emily, and then spent about half an hour with staff and students, getting involved in learning activities and talking about school. The pupils involved did the school proud, and were very articulate and informative and I know both ministers found the visit helpful. That day too we welcomed pupils from Risca Primary, Ty Sign Primary and Waunfawr Primary to school to watch our production of A Midsummer Night’s Dream. This was the play we performed as part of the Shakespeare School Festival at the Newport Riverfront last November. Everyone I spoke to really enjoyed it. Thanks to the cast for putting the play on again, and thanks to our visitors for coming along. They were also involved in some student-led workshops, and in the afternoon the play was performed to our own Y7 pupils. As part of Children’s Mental Health Week our Mental Health and Wellbeing group organised a Time to Talk Day event on Thursday. This group is very active in the school and I am indebted to them for the work they do. They were organising an anonymous survey about mental health and will be sharing the results with me. I look forward to meeting them to discuss this in the near future. They made a really good video about the day which they published on their Twitter account, @RCCS_MH. Also on Thursday our PTA group, FORCE, hosted a special Quiz and Curry Night. This was a great event, held to raise funds for outdoor seating for our pupils; we hope to get that sorted over the next few months. Well done to 7ED, they really have done well in the attendance competition this year and have won yet again this week!